Have you ever eaten caviar with a spoon? We’ll teach you how. 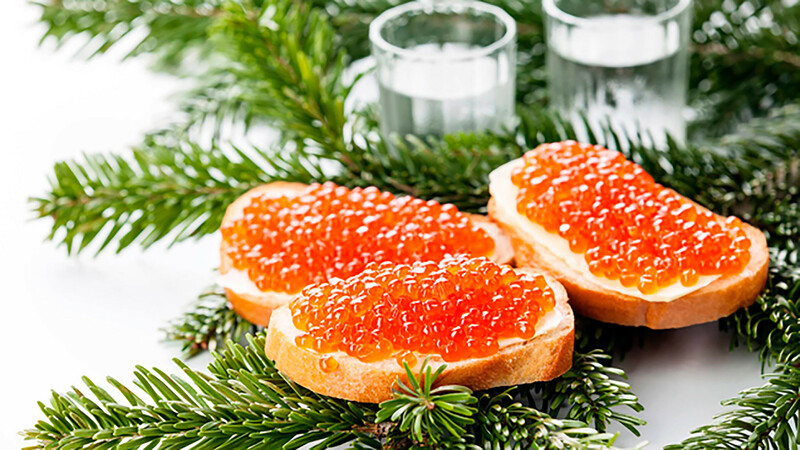 The average Russian family can save up all year and for the New Year’s table buy red caviar. 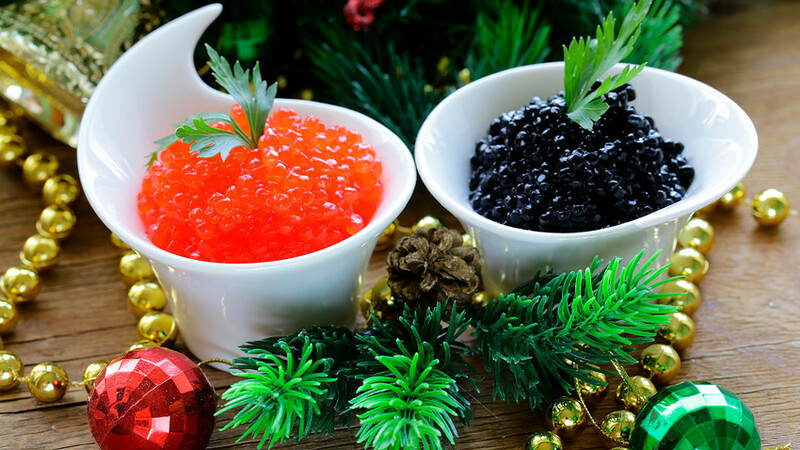 It is caviar that has remained one of the most popular gifts in Russia. Russia Beyond explains the correct way to buy and eat caviar. Red caviar is usually sold by the pound or in tin cans or sealed glass jars. It is better to buy caviar by the pound. Usually caviar in cans contains a lot of salt and preservatives. If you buy a glass jar, you can at least see the caviar, but if you buy a tin you never know what you will get. Moreover, the producer may deceive you by increasing the weight of the can. If you decide to spoil yourself and buy black caviar, be particularly careful. Firstly, you probably have never seen it and secondly, it is usually illegal to sell black caviar by the pound and therefore the vendor will not be able to let you try it. Caviar eggs must be sturdy and not cracked. In terms of size, they must all vary. If all the eggs are of the same size, something is wrong. If there is a large quantity of viscous substance between the eggs or the eggs themselves are turgid, this is also a cause for concern. The egg must also have a so-called eye – a small dark dot. If it’s not there, you are looking at counterfeit caviar. What kind of taste and smell does caviar have? Real caviar must have a neutral smell, not a sour one. When eaten, it must burst and quickly dissolve. If the shell crunches as you bite, it is counterfeit. More often than not you will find three types of salmon caviar in stores: chum, pink and sockeye. Chum salmon has large eggs of an orange color interspersed with red and a delicate taste. Pink salmon has medium-sized eggs with a bright orange color and a slightly bitter aftertaste. Sockeye salmon has small eggs of a dark red color with strong smell and a bitter aftertaste. It is difficult to say which is best, but most people prefer chum or pink salmon caviar. Lucky are the few who have eaten real black caviar. This is what its color should look like: the color of the most expensive black caviar, the Beluga, varies from slightly dark gray to dense black. The brighter this caviar, the more expensive it is. The Kaluga caviar’s color can be dark gray, brownish or black. 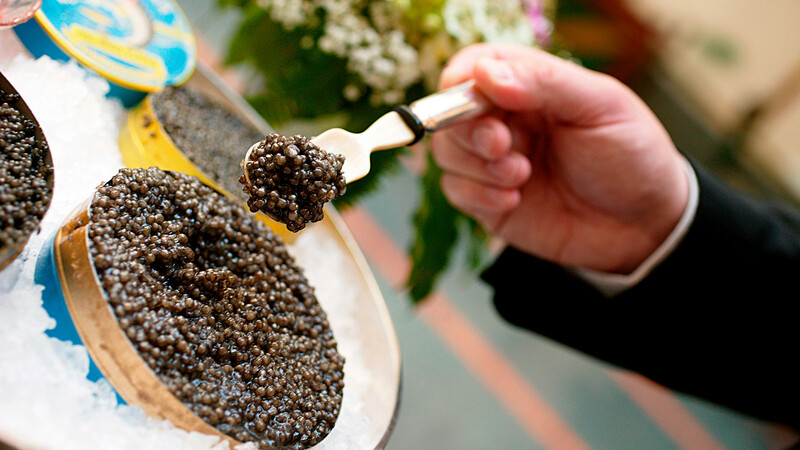 Sturgeon caviar has a yellow-brown or bronze hue. When buying caviar in a can, you should check its production and packaging date. The period in between must not exceed six months. Moreover, keep in mind that salmon spawns from July to September. This means that red caviar must be produced no later than the beginning of October. The average price of red caviar starts at 250 rubles ($4.20) per 100 grams. Black caviar costs much more: starting at 4,000 rubles ($67.60) per 100 grams. The classic way of eating caviar in Russia is in little sandwiches with white bread and butter. Another way, especially for New Year’s, is eggs stuffed with caviar. In the Russian tradition caviar is also served with bliny (crepes) or as an appetizer with vodka. You can also add caviar to a salad or a sauce, or use it to decorate a hot dish. If quantity permits, it does not hurt to eat it once a year with a spoon. Just don’t over indulge!